Engineers have made a metamaterial that can change its shape and properties, then fully return to its original configuration on demand. Metamaterials have properties that do not occur in natural materials. However, these properties are typically fixed. 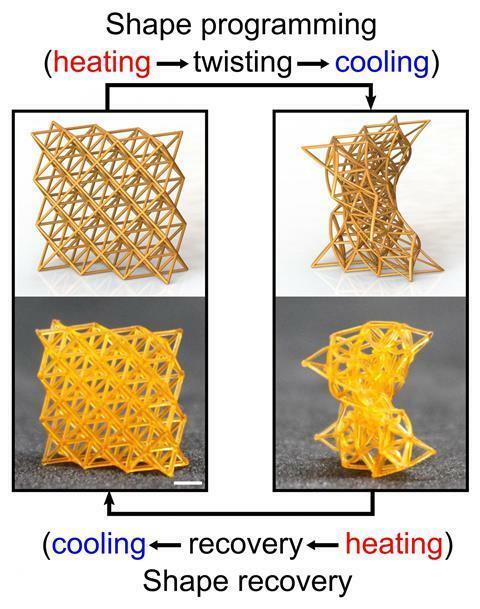 Now, Howen Lee from the State University of New Jersey, US, and his colleagues have used 3D printing to make a shape memory polymer lattice out of acrylic acid crosslinked with bisphenol A ethoxylate dimethacrylate that is both geometrically reconfigurable and mechanically tunable. We would like to highlight the Outstanding Reviewers for Materials Horizons in 2018, as selected by the editorial team, for their significant contribution to the journal. The reviewers have been chosen based on the number, timeliness and quality of the reports completed over the last 12 months. We would also like to thank the Materials Horizons board and the materials community for their continued support of the journal, as authors, reviewers and readers. Scientists in India have made graphene field-effect transistors that work for over 10 months with some help from discrete inorganic structures. The approach has led them to produce a graphene logic inverter that is stable in ambient conditions. Conventional electronics tend to be silicon based, due to the ease of doping silicon with either electrons or holes. These two forms of silicon, n- and p-type, are the building blocks of electronic devices. However, it isn’t possible to make silicon electronics on the nanoscale, so many researchers are turning to materials like graphene. An essential component of digital electronics is a logic inverter – a device for switching between fixed voltage levels. Inverters combine n-type field effect transistors and p-type field effect transistors, so require both n-type and p-type graphene. Congratulations to the winners of POLYMAT Spotlight 2018 prizes! By Hannah Kerr, Development Editor. POLYMAT Spotlight 2018 was the second edition of a series of meetings that take place in San Sebastian (Northern Spain), which after the success of the first edition in 2016 is now organized on a biannual basis. POLYMAT Spotlight is organized by Aurelio Mateo-Alonso from POLYMAT, an institution which encompasses two research organisations that focus in fundamental and applied polymer research, respectively. The meeting brings together a small audience of world-wide recognized scientists (~100 participants) in a beautiful location, San Sebastian’s Miramar Palace, with some of the most spectacular views of the bay, which favour interactions between the participants with a social and gastronomical program in the same Palace. In addition, 19 contributing lectures, 10 flash presentations and 26 posters have been carefully selected to provide a solid research forum. 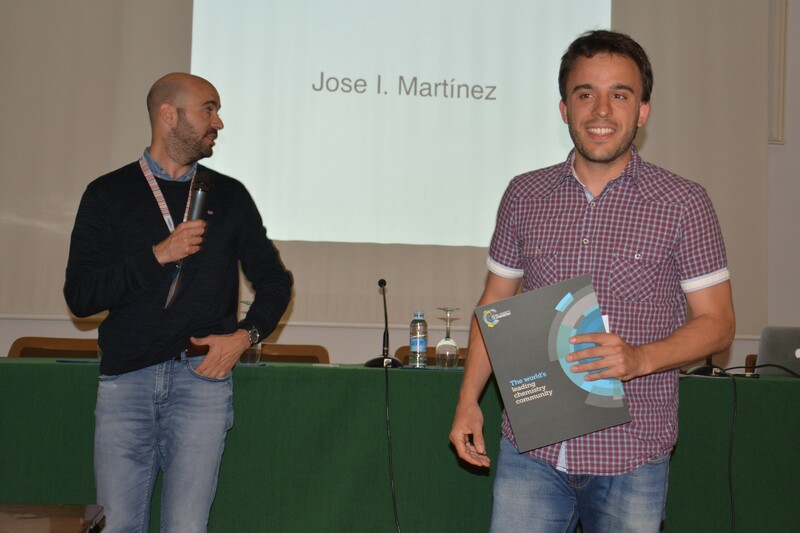 Journal of Materials Chemistry C and Materials Horizons have supported POLYMAT Spotlight 2018 with the award of two poster prizes that were selected by Plenary Lecturers William Dichtel and Dieter Schlüter in a ceremony conducted by Luis Hueso, associate editor of Journal of Materials Chemistry C.
After this second edition, POLYMAT Spotlight has established itself as reference scientific meeting in macromolecular materials and we are looking forward for the next edition in 2020. 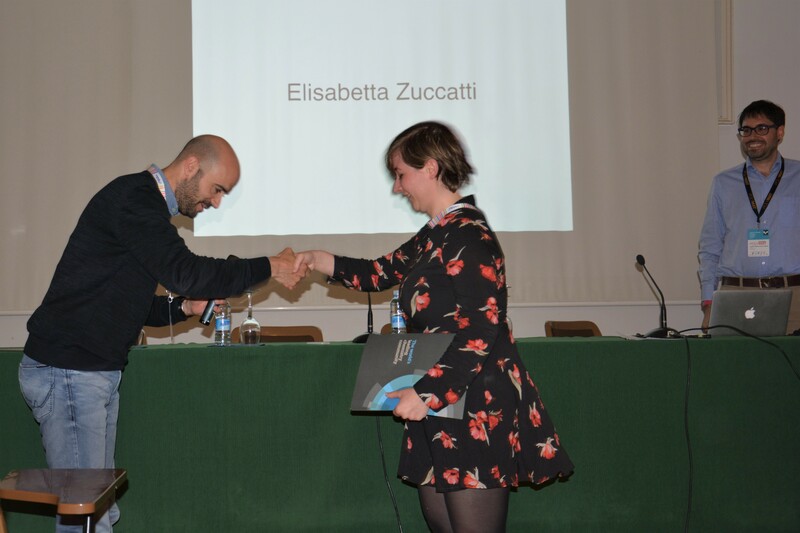 Congratulations to the winners of ICEAN 2018 poster awards! 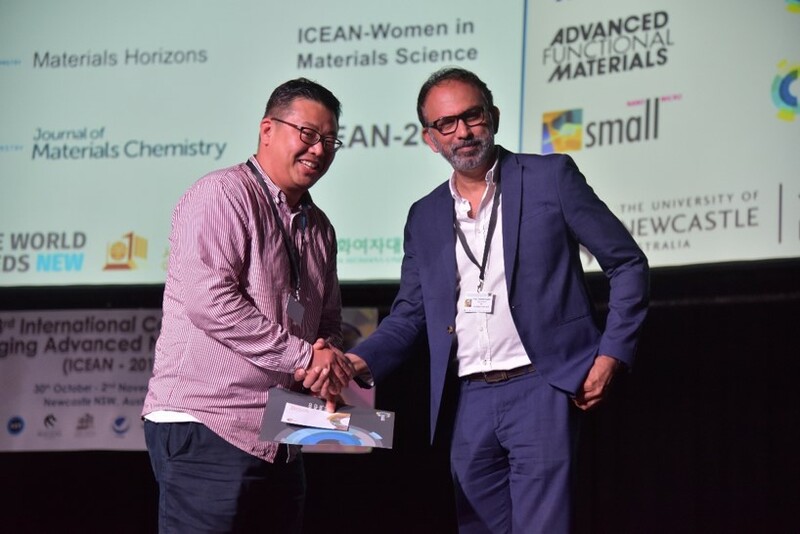 Materials Horizons is delighted to have supported the International Conference on Emerging Advanced Nanomaterials (ICEAN) 2018, along with the Journal of Materials Chemistry A, B & C.
A special congratulations to Van Chinh Hoang (University of Sydney, Australia) and Sung Ho Kim (University of Newcastle, Australia) for winning the Materials Horizons poster awards! Sung Ho Kim receives his Materials Horizons poster award, presented by Professor P. M. Ajayan, Rice University USA. Van Chinh Hoang was awarded first prize for his poster entitled “High efficiency supercapacitors based on carbon quantum dots from vegetable waste”. Sung Ho Kim was awarded the runner-up prize for his poster entitled “Ordered N-rich mesoporous carbon nitride-MoS2 hybrids as an anode materials for Li and Na ion batteries”. Congratulations to everyone who presented a poster at ICEAN 2018! Scientists in China have made a rewritable electrochromic display using a hydrogel for the first time. Typical electrochromic devices contain upwards of five layers, their complicated structures contributing to high production costs and hindered performance. Now, a team led by Hong Wang of Xi’an Jiaontong University has devised a much simpler structure. Their system contains a multifunctional hydrogel deposited directly on a tungsten oxide film on top of an F-doped SnO2 (FTO) layer. 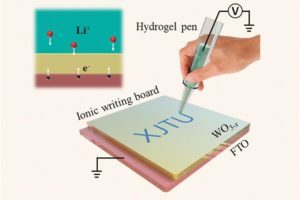 To make this possible, the researchers embedded the hydrogel with aqueous lithium chloride, allowing it to simultaneously act as a transparent electrode, electrolyte and ion storage layer. By reducing the number of interfaces present in the device, the team were able to improve the performance of the device for display applications, compared to other electrochromic systems, while also reducing production costs. 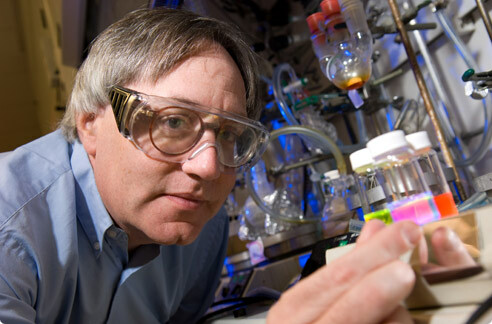 Congratulations to Professor Seth Marder, Georgia Institute of Technology and Materials Horizons founding Editorial Board Chair. He has been elected as the recipient of a Humboldt Research Award from the Alexander von Humboldt Foundation. The award is granted in recognition of a researcher’s entire achievements to date to academics whose fundamental discoveries, new theories, or insights have had a significant impact on their own discipline and who are expected to continue producing cutting-edge achievements in the future. Seth is internationally recognized for his leadership in developing structure-property relationships for organic and metallo-organic materials for optical and electronic applications. Award winners are invited to spend a period of up to one year cooperating on a long-term research project with specialist colleagues at a research institution in Germany. As part of his award, Seth will be hosted as a visiting researcher by Professor Norbert Koch at IRIS Adlershof and the Department of Physics of Humboldt-Universität zu Berlin. For few- and single-layered materials like graphene to be industrially useful there needs to be a scalable, cheap and reproducible way to produce them. Now, scientists in Italy have come up with a new exfoliation process that meets all of these requirements. Francesco Bonaccorso and co-workers from the Italian Institute of Technology propose what they call a high pressure wet-jet-milling process to, essentially, blast apart layers of materials like graphite. A hydraulic mechanism and piston generate up to 250MPa of pressure to push a mixture of the bulk material dispersed in solvent through five different disks. The disks are interconnected and perforated with tiny adjustable holes (0.3–0.1mm diameter), which generate colliding jet streams. A similar idea is already used in industry to pulverise drugs or paints. The major advantage here is that it takes only minutes to produce high quality 2D crystals that would take hours to make by other methods: it takes less than 3 minutes to make 1g. The resulting dispersions of 2D crystals are shown to be usable for inkjet printing and in battery anodes without needing a purification step. Read the article in Chemistry World here. Materials Horizons is delighted to announce its latest Impact Factor is 13.183*. We are delighted to see the continued support from the community to help us maintain our extremely high standards and focus so that we only publish reports of new concepts of exceptional significance to the materials science readership – thank you! To celebrate we have selected a few recent articles and made these free to access until the end of August – we hope you enjoy reading them. Read more of our latest articles here. At Materials Horizons, our reviewing standards are set extremely high to ensure we only publish first reports of new concepts across the breadth of materials research. Our Impact Factor of 13.183* is testament to the exceptionally significant work of our community. 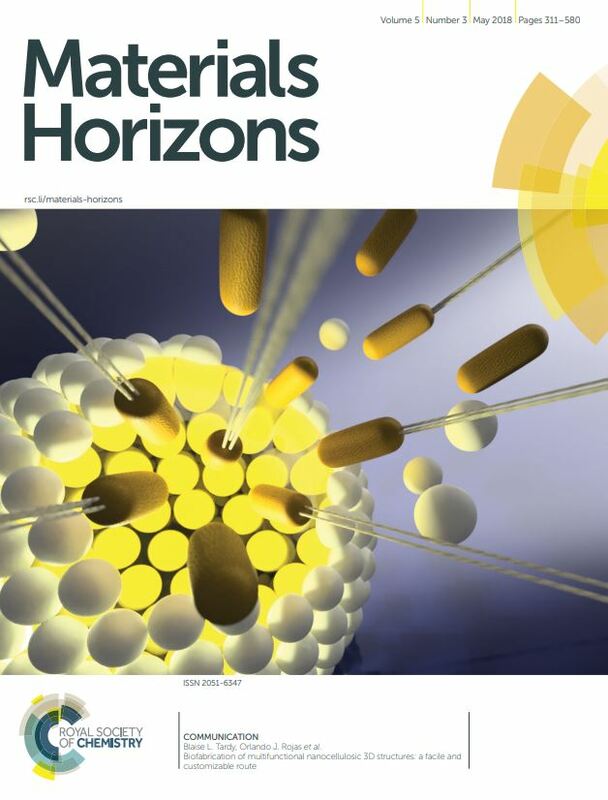 Click here to read recent articles describing new concepts in nanoscience & nanotechnology in our sister-journal Nanoscale Horizons, impact factor 9.391*. *2017 Journal Citation Reports (June 2018) © Clarivate Analytics. The Carbon Group of the Portuguese Chemical Society (C@SPQ) cordially invites you to attend the 8th International Symposium on Carbon for Catalysis, CarboCat–VIII, that will take place in Porto, Portugal, on June 26 – 29, 2018. Following the previous CarboCat meetings held in Lausanne (2004), Saint-Petersburg (2006), Berlin (2008), Dalian (2010), Brixen (2012), Trondheim (2014) and Strasbourg (2016), CarboCat-VIII will be devoted to new developments and fundamental advances on carbon materials (conventional and nanostructured carbons) for catalytic applications. Catalysis Science & Technology together with Energy & Environmental Science, Materials Horizons and Journal of Materials Chemistry A are delighted to be supporting the event.